T J Hughes is the best known name in London Road. 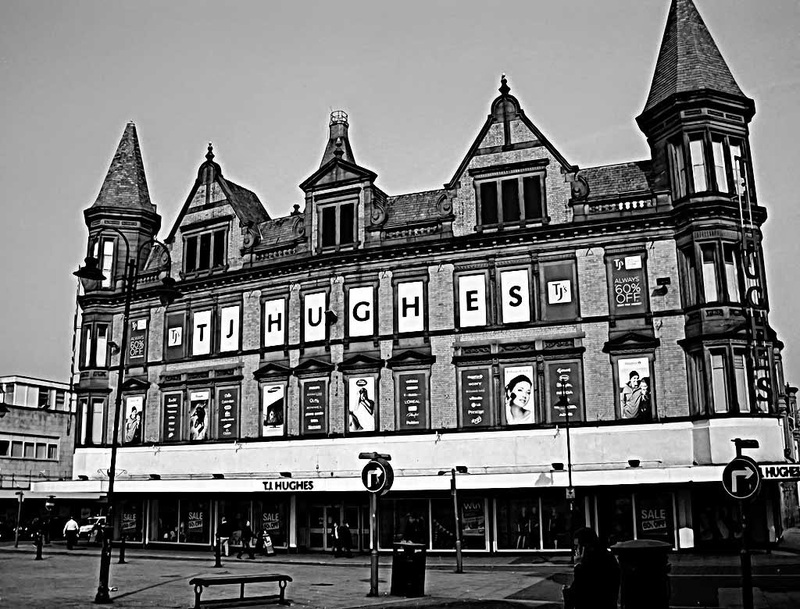 Indeed, the company itself, T J Hughes, was one of the most famous retailers in Liverpool and was a major name in shopping centres and towns throughout England and Wales. It was perhaps inevitable, from the day he was born on 21st March 1888, that the company’s founder, T J Hughes would eventually choose to set up in business as a retailer in his home town, the city of Liverpool. Thomas J Hughes’ father, James Hughes came from the Corwen area of North Wales and was also in the retail industry. Consequently Thomas, a Welsh Liverpudlian, grew up surrounded by all aspects of the trade. The Hughes family dynasty had in fact, originally begun when James married his wife, Anne. Previously, James had worked for Edward Morris and Anne had gathered vital experience working in a shop. Together however, the couple bought their own shop in Old Hall Street and along with this, purchased 11/13 Country Road in Walton. 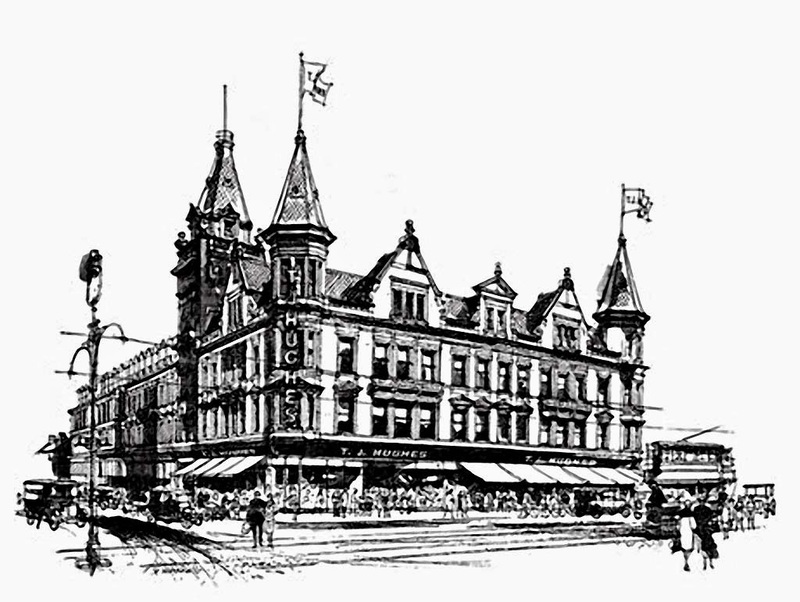 When they opened the shop in 1889, it became the first, though not the most famous, Hughes store. 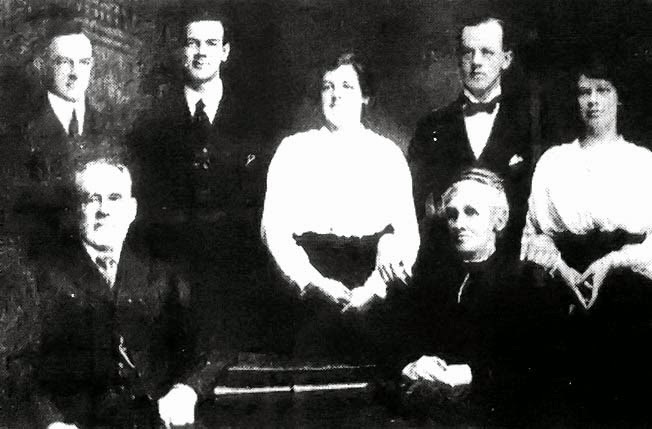 The Hughes family, T J Hughes third from the left. Only a year old when his parents opened their first shop and as a result, Thomas enjoyed a childhood filled with memorable experiences of life within the retail industry. After leaving school, Thomas served his apprenticeship as a draper at Audley House, then Owen Owen. He must have enjoyed the experience but, little did he know then, that he would end up owning the place and running his own business from there! After completing his apprenticeship, Thomas went to work briefly at Blacklers in Liverpool and then moved to London to work. However, after gathering this invaluable work experience outside the family business, Thomas moved back to Liverpool once again and began working for his father. Thomas J Hughes left his father’s firm in 1912, by mutual agreement. In the October of the same year, 1912, with the help of his savings which amounted to £150, Thomas J Hughes managed to found his own business and opened a shop at the corner of London Road and Norton Street with the name, T J Hughes above it. In the early days, the store was comparatively small. However, despite its size, the fledgling business soon began to thrive and it was not long before Thomas himself found that even a small concern could prosper given low profits and a rapid turnover. The advent of the first world war brought with it a certain amount of disturbance for T J Hughes. It was during these years that Thomas himself temporarily left his business in order to join the Royal Flying Corps and serve his country. Indeed, this was a brave and admirable decision and, in fact, Thomas’ name was added, along with his brother Hugh’s, to the European War Roll of Honour compiled by the Calvinistic Methodist Church of Wales. By the time Thomas had to leave for war, he had employed three assistants to help him run T J Hughes. Fortunately, whilst he was away, Thomas left the store in the capable hands of one of his assistants, Miss Harris and it was she who carried on the good work in his absence. In this way, T J Hughes managed to continue operating throughout the war. TJ Hughes flourished after the war and experienced a period of rapid growth. Consequently, the year 1927 proved to be a ground breaking one and marked an important turning point in the history of the company. By this year, the managing director of the business located at Audley House, Duncan Norman, was experiencing difficulties. One of the most urgent problems facing Duncan, as he set out to put his firm, Owen Owen Ltd, back on its feet was the question of what to do with Audley House. The building was an excellent one, modelled on that of Marshall and Snelgrove’s in Oxford Street, London, and at that time officially valued at £194,000. Now it was lying idle however, its value had plummeted and at one point, under pressure from the bank, it was very nearly sold to another firm for a mere £60,000. After consulting his architect, Aubrey Thomas, Duncan decided to contact another draper in the London Road area. The man in question was Thomas J Hughes. At the time he was approached by Duncan Norman, Thomas’ concern was thriving to such an extent that he was employing 200 people and finding it difficult to cope with all the ever increasing business. The extreme success of the business, at a time when its rivals were struggling, meant that the premises at the corner of London Road and Norton Street were becoming seriously overcrowded. 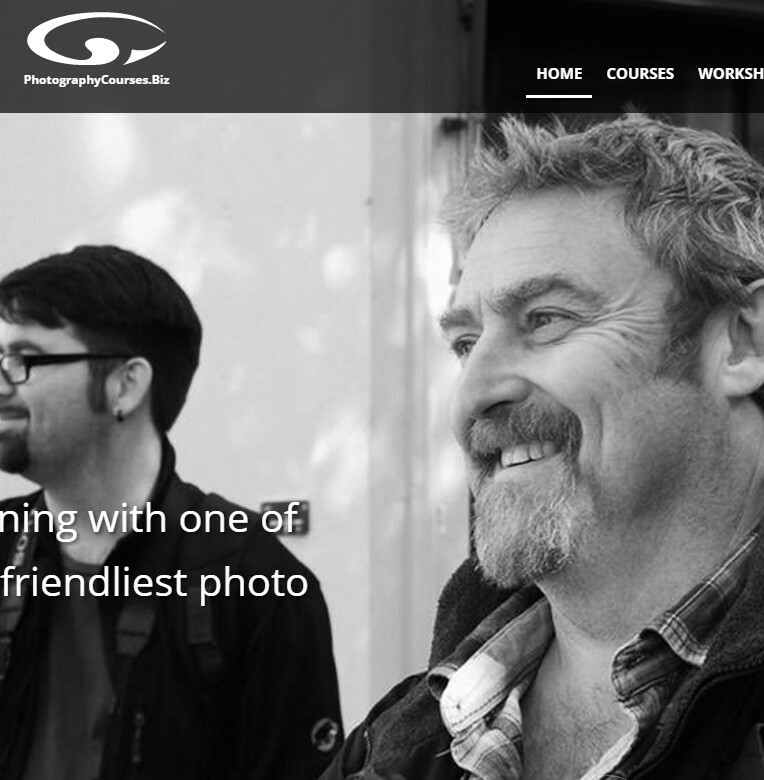 The meeting with Duncan Norman could not have come at a better time. The men agreed that Thomas would sell his business to a small private company to be known as T J Hughes & Co Limited. Thomas would be the sole managing director of the company with Duncan as chairman and the only other director, and this newly formed company would move into part of Audley House with an option to expand further if necessary. Thomas made all the final decisions himself and even drafted his own advertisements for insertion in the Liverpool Echo. He also had a natural flair for fashion and as a result, as well as one of the cheapest shops also had one of the most attractive shops in Liverpool. This success did not come without Thomas’ hard work and dedication and it was very rare that he took a holiday but when he did, he never forgot to telephone his assistants to find out what was happening. The move to Audley House proved to be extremely successful. Indeed, the two years following the move were ones of unbroken prosperity. It was not long before T J Hughes & Co Ltd took over the whole building and business began to boom at Audley House once again. Thomas’ accounting system and some of his organisation was a little primitive, but because I people flocked to see the I bargains he offered, turnover was enormous. One former customer remembers buying a bed for 19s, two cups, saucers and plates for is 6d, and I a set of curtain material at 1/s a yard - with bargains like these there is no wonder that Thomas was regarded as the pioneer of cut price trade. Inevitably, after years of almost inhuman dedication and hard work, Thomas began to feel the strains of his success. The pressure he put himself under became unbearable and without a modern bookkeeping system he faced a formidable task trying to keep track of everything single-handedly. Consequently, Thomas’ health began to suffer. Duncan tried, to no avail, to persuade him to take a So, on 19th February 1932, Thomas J Hughes finally retired from his business and his post as managing director. His shares were bought at par for £35,000 by Owen Owen Ltd. Sadly, only a year after his retirement, on the 14th April 1933, Thomas J Hughes died just 43 and although the company still bore his name, this event marked the end of a propitious and unique era. In the year of his death an advertisement was produced for the company promoting its ‘21 Years Progress’. The advert stated, ‘From a tiny shop with three assistants to the present huge store with a separate “Household” building connected by underground subway. Such progress in 21 years has not been equalled by any other retail store in the North of England!’. Such progress could not have been achieved without Thomas’ work, innovation and inspiration. Despite Thomas’ death and departure from the company, the roots had been laid for a stable and consistently successful business. 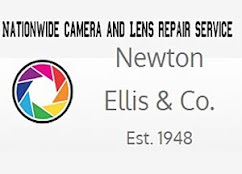 By this time, in order to add to its success, the company had begun conducting promotions, and there is no doubt that these promotions played their part in the continued success of the business. 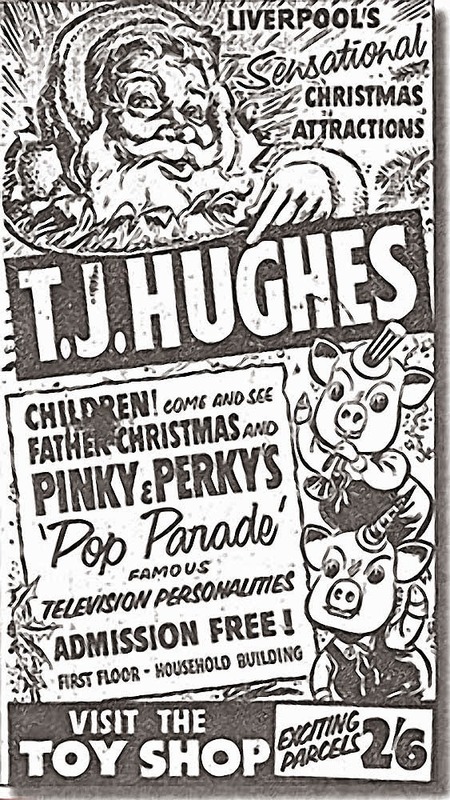 T J Hughes was known locally for its value and range of products and famous for it Grottos with appearances by children's favourites Pinky and Perky and the famous Dancing Waters Grotto in 1961. 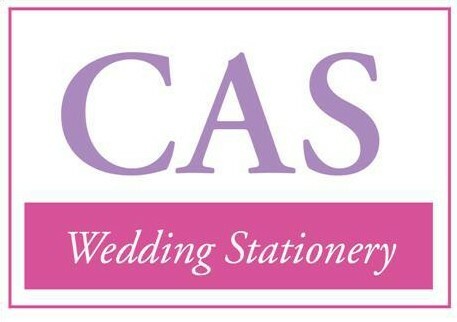 On Monday 27 June 2011, TJ Hughes Limited announced that it intended to go into administration. T J Hughes officially entered administration on Thursday 30 June 2011 with Ernst & Young appointed as administrators putting 4000 jobs at risk. 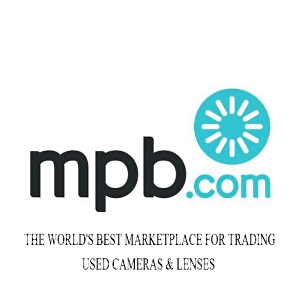 The company launched a closing down sale, with "1000's of items reduced" in a bid to reduce stock levels. Six of the 57 TJ Hughes stores were bought out of Administration by Lewis's Home Retail Ltd (Part of the Benross Group). The remaining six stores continued to trade under the TJ Hughes brand name. 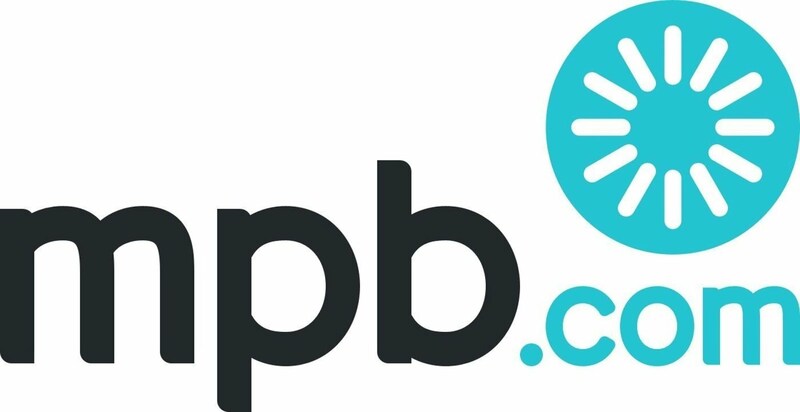 The company's online store re-launched in October 2011. The Benross group hope to bring the brand back to its former glory. But for the people of Liverpool T Js London Road will always hold fond memories and remain a part of so many people lives.